As part of a new initiative to welcome new members to NORDP and promote networking and collaboration among new and old NORDP members, the Membership Committee is setting up a process whereby a regional representative will contact new members shortly after they join to welcome them to NORDP, answer any of their questions about the organization, and encourage them to attend the annual conference. Representatives can also encourage new members to fill out a full website profile and familiarize them with the available website resources (job notices, lists of program evaluators/consultants, NORDP numbers survey). These representatives will act as ambassadors at the NORDP annual meeting to help new members meet others and connect with the organization more broadly. As such, NORDP is asking for volunteers for four of the remaining open regions (see below). Please Ann McGuigan, Committee Chairperson, at amcguigan@email.arizona.edu if you are interested in serving as a regional representative or if you have questions about this initiative.. And if you are in a region that currently has a Regional Liaison and would like to assist in these activities, please contact the Regional Liaison for your region: they will definitely welcome your help! Domestic: Connecticut, Maine, Massachusetts, New Hampshire, Rhode Island, Vermont. International: Quebec, Ontario. Domestic: Delaware, Maryland, New Jersey, New York, Pennsylvania, D.C., Virginia. International: Europe, Africa, Western Russia, China and countries west & south of China. Domestic: Alabama, Arkansas, Florida, Georgia, Kentucky, Louisiana, Mississippi, North Carolina, Puerto Rico, South Carolina, Tennessee, Virgin Islands, West Virginia. International: South America. Domestic. Illinois, Indiana, Michigan, Minnesota, Ohio, Wisconsin. International: Mexico, Manitoba. Domestic: Iowa, Kansas, Missouri, Nebraska, North Dakota, South Dakota, Idaho, Montana, Wyoming, Nevada, Colorado, Utah. International: Alberta, Saskatchewan. Domestic: Arizona, New Mexico, Oklahoma, Texas. Domestic. Alaska, California, Hawaii, Oregon, Washington. International: British Columbia, Eastern Russia, Korea, Japan, Philippines, Australia, New Zealand, and other countries east of China. In In the Fall 2013 NORDP newsletter, the NORDP Northeast (NE) regional group published an article on the history and impact of our small and relatively new faction. We briefly delved into the value our participants receive: rich presentations and problem-solving in our bi-annual conferences; relationships and collaborations that extend beyond the borders of our meetings; and open exchange of tools, ideas, and business cards. In this latest article, we share our progress over the past year, including a debrief of our most recent – and largest! – conference to date. To cater to our diverse member needs and develop a robust program, we solicited ideas for our anticipated July 2014 NORDP NE conference agenda via several avenues. First, those New England-based RD professionals who attended the May 2014 NORDP Conference in Portland, OR participated in a breakfast brainstorming session. Our NORDP NE advisory committee members—Anne Windham, Kathy Cataneo, and Susan Gomes—facilitated the session while NORDP NE communications coordinator Caitlin McDermott-Murphy organized and synthesized the session output. Second, in order to include input from those unable to attend the National conference, we disseminated this information to our NORDP NE July conference planning committee. We expect to continue to seek input for future conferences through a similar variety of methods in order to best serve our diverse constituents. 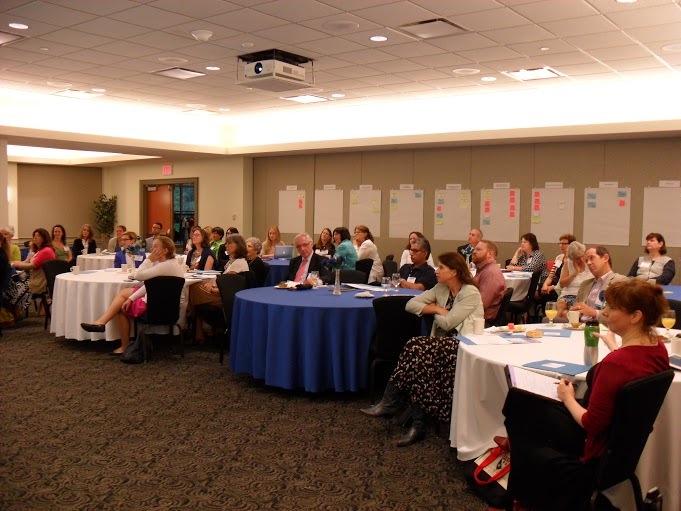 In July, the University of New Hampshire (UNH) at Durham and current chair, Kathy Cataneo (UNH Director of Research Development & Communications) hosted our Summer NORDP NE conference. The conference theme was “Inter- and Intra-Institutional Collaboration,” a theme not just evident in our session topics and activities but in our attendees as well. We welcomed ­­­fifty-five participants—our highest attendance since the founding of NORDP NE three years ago. This number included attendees from states previously unrepresented and, in fact, Research Development professionals arrived from every New England state, a first for our burgeoning group. In addition, we welcomed special guest Karin Scarpinato from Georgia Southern University. Karin is launching a regional group, analogous to NORDP NE, to serve RD professionals at institutions in the Southeast. With this goal in mind, she requested to attend and observe our July conference to gain insight, ask questions, and share her own ideas and impressions. We look forward to learning about the Southeast region’s progress and to share tips and pitfalls as both our groups grow. More often than not, session co-presenters hailed from separate institutions, resulting in rich debates with alternate perspectives, experiences, tools, and methods, as well as new cross-institutional partnerships. In addition to concurrent sessions, the NORDP NE July conference included two new activities. To kick things off, each institution offered 2 to 4 current institutional research strengths (or “pillars”) as well as 2 to 4 aspirations (See image 1). As attendees settled in, networked and enjoyed the lavish breakfast spread, they also took a moment to paste their institution’s name beneath different research areas written across one wall, signifying that area as an institutional “pillar” or “aspiration.” This shared resource will encourage and assist institutions to seek new collaborations and partnerships across our region. The second new activity occurred over lunch: each roundtable featured a representative from those offices that collaborate with UNH RD staff most frequently. UNH provided the hosts, who hailed from: Research Administration; Commercialization, Technology Transfer, and Innovation; Cyberinfrastructure; Corporate and Foundation Relations; Graduate School and Graduate Student Support; Government Relations; Broader Impacts, Engagement, and Cooperative Extension; and Communications For and About Research. These “Themed Roundtables” provided an opportunity to ask questions about the scope of these offices, where Research Development might intersect, and how to develop partnerships to add value to what we individually and collectively offer our faculty. Moving forward, NORDP NE will look for opportunities to extend our regional collaboration even further. With Federal budgets tightened—and tightening—program officers receive less travel funding at a time when our faculty arguably need their close guidance and influence more than ever. As such, RD offices—and the faculty we serve—benefit from organized collaborative events that serve not just one institution but an entire region. Our region has, for example, benefited from such an event. This past September, UNH organized a webinar on the “Fundamentals of the NIH and the NIH Grants Process”, featuring Megan Columbus, Director of the Office of Communications and Outreach in the NIH Office of Extramural Research. UNH advertised the webinar to its NORDP NE partners and, as a result, recorded over 275 faculty, postdoctoral, graduate student and staff participants across New England (with a few in Canada, New York, and Texas no less). This proved to be a “win-win” for NIH and NORDP NE institutions. We plan to seek additional opportunities to share such resources and to leverage our regional numbers to entice program officers to visit and interact with our researchers. There is power in numbers!